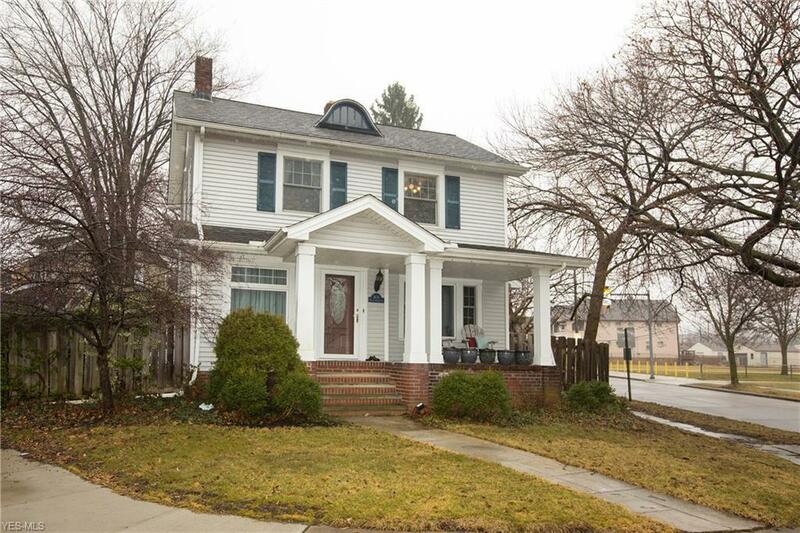 Classic West Park Colonial with rocking chair front porch. Same owner since 1975! First floor features an inviting living room with full wall mantle and fireplace. Spacious dining room perfect for all of your gatherings. Remodeled kitchen and breakfast nook (2014) with dover grey stone cabinets, granite countertops, stainless steel sink, and subway tile backsplash, recessed and under cabinet lighting. Second floor features spacious master bedroom, two additional nice sized bedrooms with plenty of closet space and built-in shelves. Full bath with Jacuzzi tub, pedestal sink, porcelain tile surround and flooring. Office with cabinets and countertop space. Walk up attic for storage. Basement features relaxing recreation room with knotty pine paneling, built in shelves and decorative fireplace. Crafting room, half bath laundry and workshop room. Two car detached garage (2018). Fenced in yard, stamped concrete patio and storage shed. Additional updates include glass block windows, vinyl siding, 100amp electrical. One year home warranty. This one wonât last. Call for your showing!